WHILE thinking about an article this week I came across information about some of our town centre shops that are no longer in the town and thought this may be of interest, especially with the changing view of town centres across the country. First, I thought of Woolworths, which opened in London Road in 1929, just in time for allegedly to allow Queen Mary to shop here, during King George V’s convalescence in the town. It was reported that a reward of £500 was offered for a picture of her in Woolworths. This was never claimed. People will have so many varied memories of this store, what it sold and its reputation but who can remember its tea bar and also that, for a time, it sold food including cold meats? By 1950, the store was given a major makeover. Sadly, the one memory that will be uppermost in Bognor Regis people’s mind will be the disastrous fire that occurred on August 31, 1978. This £2m blaze was attended by 200 firefighters and five fire appliances which had travelled for more than 50 miles. The fear was that fire could spread to other stores in London Road. The fire service did a splendid job to retain the fire within the one store, which, ultimately, had to be demolished. I can remember a woman at an event remembering Woolworths was once in our High Street, which everyone disagreed with, until we remembered that they had been in a temporary location there until the new store was opened in November, 1979. In 1994, it became part of a major story, when the IRA bomb exploded outside the stores in a cycle rack. Sadly, it was announced nationally the company would cease trading and the Bognor Regis store finally closed on December 27, 2008. It still retains its original façade above the new store sign for Wilko which moved into the premises, selling a style very similar to the bygone Woolworths range. Next, we can look at the Co-op, which I know is still in the area, but not in the town Centre. The Co-op, of course, was historically quite an institution which gave out stamps. Do you remember your Co-op number? My parents’ was 11188. Today, of course, this has all ceased and it is yet another plastic card. The Co-op arrived in Bognor Regis in 1933 as the Portsea Island Mutual Co-operative Society in Canada Grove, the premises are still there with a supermarket, opposite the Queensway. It also had a milk depot in Ockley Road which was handy when I lived nearby. I could nip around the corner to get more milk or even a tub of Devonshire cream. During the Second World War, its advertising included the phrase, ‘let the Co-operative take care of your emergency ration cards’, specifically for people who managed to have a holiday. With increased trade it was finally decided to expand into No 62, High Street, first into a two-storey premises near the current NatWest building. A few years later, it opened another store at No 55 High Street – this time, more of a department store selling more and more items, such as clothing, carpets and furniture, catering for all our household needs and known as a ‘Home maker.’ This included a 14ins TV for £169. On closure, this premises were occupied by the local shop of Garforth’s. From 1993, the Co-op had premises in Hawthorn Road, where it remains today alongside other locations in the area. Eventually, out of town shopping was taking over from these stores and our town centre premises closed. Today, the Co-op is serving the community with their much smaller food supermarkets, some of which have occupied public houses such as the Kings Beach Hotel in Pagham, a trend increasing nationally. 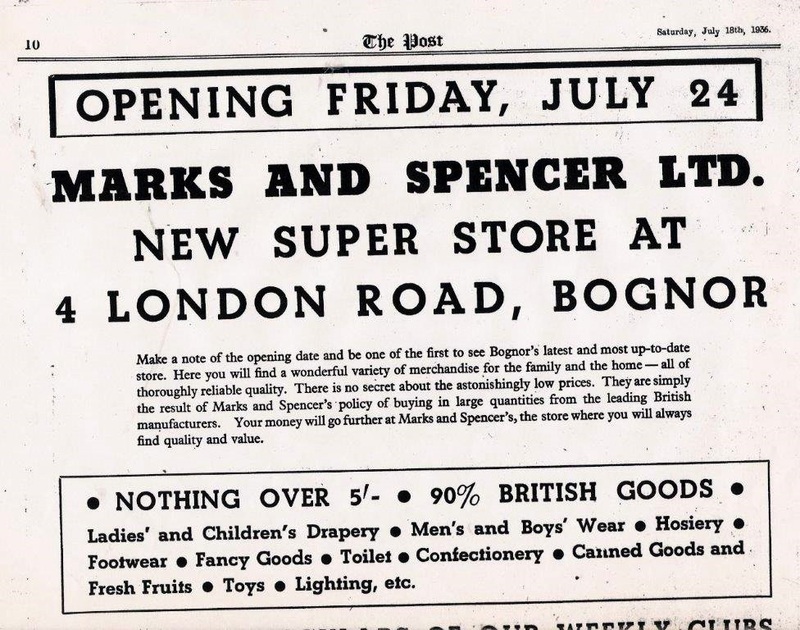 Finally, missing from our town centre, but not locally, is Marks and Spencer, which opened in London Road in its newly constructed store on July 22, 1936. Its initial advertisements announced nothing cost more than five shillings (25p) and 90 per cent of goods were British-made. Another feature of these stores was apparently their weekly clubs. Their range of goods and clothing was very similar to their offerings today. They were a very respected store in all towns with their aim of pleasing the customer, buying in large quantities, enabling them to sell at a reasonable price for the customer. When television advertising began in 1955, the company resisted the change, relying purely on reputation. By the 1990s, this policy changed and we are all aware of the styles of advertising on all mediums today. As the company peaked, there were major changes taking place within the organisation and, to the shock of our town, customers were told in the summer of 1990 the impressive store was closing. Nothing was known of this pending closure, even the staff were not told until they were given information slips for the customers. The shock was felt throughout the town and even more so when it was announced that a second store was opening in Chichester. The M&S premises were eventually taken over by Littlewoods, until it also left the town centres to be an online outlet across the country and the building is now occupied by New Look. A M&S Foodhall returned to the town in 2015, but only on an out of town shopping area.